Dr. Enrico Gnaulati, a clinical psychologist specializing in childhood and adolescent therapy and assessment, has witnessed firsthand the push to diagnose these disorders in youngsters. Drawing both on his own clinical experience and on cutting-edge research, with Back to Normal he has written the definitive account of why our kids are being dramatically overdiagnosed and how parents and professionals can distinguish between true psychiatric disorders and normal childhood reactions to stressful life situations. "A valuable guide for parents and educators that includes tips on choosing a therapist and parenting strategies." "This book is a welcome antidote to an alarming trend." "Highly recommended for parents, caregivers, educators, physicians, and specialists working with children of all ages." This book is about the normalcy of children’s seemingly abnormal behavior. Mostly, I wrote it to give parents of struggling children hope, perspective, and direction. However, I also wrote it to counteract the pervasive tendency in our society to medicalize children’s behavior and to categorize an increasing array of normal childhood reactions to stressful life situations as proof positive of a psychiatric diagnosis. Critics of American society insist that we are a nation of people who overpsychologize. Yet nowadays, when it comes to understanding children’s behavior, clearly we underpsychologize. We shy away from trusting our own ability to decipher the ordinary human meanings, motives, and developmental reasons for why children act the way they do. This book aims to correct this imbalance. While working as a psychologist with children and families for the past twenty-five years, I’ve observed that parents are nothing short of desperate for answers that will help them to tease apart whether their kid has transitory problems or is showing signs of a diagnosable condition. The truth is, it’s exceedingly difficult to distinguish between, on the one hand, things like a lag in social and emotional growth, a mismatch between where a kid is developmentally and what is expected of him or her at school, patterns of emotional reactivity in the parent-child relationship, a difficult personality trait, or a perfect storm of all of these and, on the other hand, evidence of a psychiatric condition like ADHD (attention deficit hyperactivity disorder), bipolar disorder, or autism spectrum disorder. Yet when we look at the number of kids with these disorders, we get the impression that it’s exceedingly easy. Part of the answer lies in how similar many of the symptoms associated with these disorders are to everyday childhood behaviors. This can make the diagnostic process overly subjective and thereby slant it in the direction of doctors and therapists yielding false positives. Take attention-deficit/hyperactivity disorder. We can see shades of all children in the core symptoms of ADHD: distractibility, forgetfulness, problems with follow-through, not listening, talking excessively, fidgetiness, and difficulty waiting one’s turn. Sophisticated clinical language characterizing autism spectrum disorder, such as “deficits in social-emotional reciprocity, nonverbal communication, and developing and maintaining age-appropriate relationships,” really boils down to run-of-the-mill behaviors like showing yourself to be happy when someone else is happy, keeping good eye contact, responding to your name, and finding other kids your age interesting--phenomena that toddlers, the youngsters most apt to be under the autism spectrum lens, often have difficulty mastering. Similarly, when a toddler repeats words and phrases, is entranced by stimulating objects, and has rigid food preferences, is he or she working through something developmentally or on the spectrum? The common criteria for bipolar disorder are hard to separate from evidence of a difficult adolescent passage: irritability, temper outbursts, moodiness, fluctuations in motivation, sleep irregularities, overconfidence, and a propensity to engage in risky behaviors. This is particularly true in our twenty-first-century media-saturated culture, where ready bedroom access to screens interferes with teenagers’ sleep, causing teens to be groggy and irritable, and where participation in social-network sites like Facebook almost requires them to be self-promotional. Another part of the answer for why these disorders are massively overdiagnosed lies in how casual we have become about incorporating mental health jargon into our everyday conversations. We pin diagnoses on ourselves as if they are faddish labels or give us outlaw celebrity status. 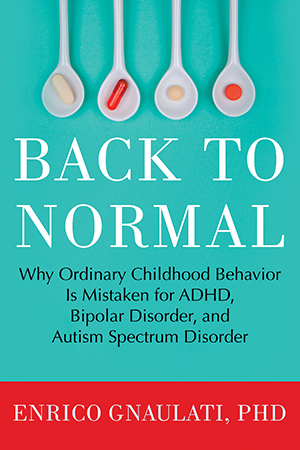 “ADHD” happens to be the name of a song by the English alternative-rock band Blood Red Shoes, and the rapper Krizz Kaliko’s hit “Bipolar” can be downloaded as a cell phone ringtone. It can seem cool to be bipolar when high-roller actors like Mel Gibson and Catherine Zeta-Jones, and legendary rock stars like Axl Rose, refer to themselves that way. Yet there are good reasons to be cautious when it comes to these diagnoses. We may be remarkably casual about tossing around mental health labels, but unfortunately, studies show that the average American still harbors negative stereotypes about kids and teens with psychiatric disorders. Large swaths of the American public still believe that a depressed teenager is a would-be violent teenager. A mental health diagnosis can also follow a kid into adulthood and potentially disqualify him or her from careers in law enforcement, the military, and other professions; make it difficult to obtain a pilot’s or trucker’s license; and jack up life and disability insurance rates for him or her. And, of course, an easygoing attitude toward diagnosing can pave the way for uncritical consumption of medications, minimizing the undesirable side effects that often accompany their use. The story of how pharmaceutical companies oversell the general public on mental illness and medications to boost their profits is a story that has been told many times. However, I will retell the relevant parts of this tale, taking the reader behind the scenes to look at how pharmaceutical reps often drive doctors’ diagnostic habits, what recent research shows about the effectiveness of medications routinely used with children, and the latest ideas by leading scholars that call into question brain-based and chemical-imbalance theories of behavior. I also will tell another story, one that most parents probably haven’t heard before. This story is about how doctors’ and therapists’ education and training primes them to think in terms of disease and disorder and often blinds them to humanistic, developmental, and commonsense explanations for children’s troubling and troublesome behavior. I am a psychologist, so telling this story has been disquieting--to say the least. When parents bring their child to me for help, I like to first consider the likelihood that the child is experiencing a stressful reaction to life events, but is otherwise normal. I am comfortable with the idea that there’s great variation across children in the rate at which their social and emotional development unfolds. Sometimes a child’s troubles simply mean that he or she is slow to mature in an area and will do just fine with some combination of adjustments to his or her daily environments, targeted parenting interventions, and garden-variety talk and play therapy. I like to think in terms of normal human variation, developmental glitches, and wellness. This is not to say that I don’t go into high gear when, over time, after an assortment of interventions, there is unquestionable evidence that a child has a disabling psychiatric condition and needs medication and other, more rigorous interventions. Sadly, however, when it comes to children’s mental health, this way of thinking is not widely shared by doctors and therapists. Often parents face overwhelming pressure to medicalize and medicate their kid’s behavior from the get-go in doctors’ and therapists’ offices. I want parents to be aware of the larger forces influencing the field of children’s mental health. One issue I address is why boys are far more likely to be perceived as behaviorally disturbed than girls, and what parents of sons can do about it. As a father of a son, I’m particularly sensitive to this issue. I see my son and quite a few other males his age act squirrelly, roughhouse, shun reading, stuff homework into messy backpacks, clam up verbally unless they have a shared activity to pursue or technical topic to discuss, and be quick to react when their pride is injured. Such observations give me a firm grounding in what’s normal. I’m thankful for that grounding. It has helped me to see more clearly how, as politically incorrect as it may sound, our understanding of “normal” behavior for children has become feminized. We tend to judge boys using standards of behavior applicable to the average girl, not the average boy. Another theme that I explore is how mental health symptoms sometimes are actually ancient, innate personality traits and coping mechanisms that have helped us adapt and survive as humans for thousands of years. Despite all the pathological talk about depression and mania, children and teens are capable of experiencing “healthy depression” and “healthy mania.” At manageable levels, depression and mania are time-honored human responses reflecting the brain’s hardwired ways of helping us to cope with attachment and loss in relationships, as well as to energetically strive for success and greater social status. Symptoms such as anxiety, aggressiveness, and action-orientedness are personality traits that would have been highly adaptive during hunter-gatherer times, but which are a liability in today’s “chalk and talk” classroom. I will share with the reader practical ways in which kids’ everyday environments can be changed in order to allow them to best adapt by making positive use of such inborn personality traits. When I set about writing this book, I knew that I wanted it to contain ample stories to which readers could relate. I wanted to describe the behavior of children who may be difficult, but who are not suffering from psychiatric disorders, in such a way that a parent could see his or her own son or daughter in them. For instance, it was paramount for me to really bring alive how ADHD symptoms often mimic normal childhood narcissism and to provide remedies for parents dealing with their kids’ challenging developmental struggles. I labored to find evocative examples of the difference between true hyperactivity and a kid’s habit of seeking needed attention and recognition in frenzied ways. I strove to highlight how sometimes a pattern of failing to finish tasks has little to do with a disordered brain and more to do with a child or teen approaching tasks with “magical thinking” about what can be accomplished. Similarly, I wanted to show how forgetfulness can sometimes be nothing more than a kid’s underpracticing and underpreparing because he or she is overconfident. These scenarios, I thought, would help a parent discern whether his or her own child actually was afflicted with a disorder or was stressed for other reasons. I felt it was necessary to include longer case descriptions in order for readers to confidently grasp the finer points of children’s expectable, troubling reactions given their personalities and life circumstances, as compared with signs of a true psychiatric condition such as bipolar disorder. Readers will be introduced to seventeen-year-old Brandon, whose bipolar rages are best explained in terms of the harmful ways he deals with his tendency toward shame and the emotional flooding and reactivity that flares up when he and his mother are in conflict. Readers will also meet William, who was falsely diagnosed with autism spectrum disorder at age five. His case rather dramatically shows how brainy, introverted, individualistically minded boys with a passion for ideas and strong needs for interpersonal control can get mislabeled as autistic in their younger years. In all the case snippets and studies that I’ve included, I changed names and disguised factual information for confidentiality reasons. But essential phenomena, meanings, and outcomes have been preserved. At no time do I use purely fictional accounts. I’ve concentrated on success stories. These are the kids in my practice who appeared to be poster children for major psychiatric disorders when I first met them, but with family lifestyle changes, parenting interventions, play and talk therapy, and the passage of time, did not merit any such diagnosis. These sorts of cases are not rare. The reader will be reassured to learn about scientific evidence showing that upwards of a third of teenagers diagnosed with bipolar disorder are no longer diagnosable as bipolar by their mid- to late twenties and that approximately one in five toddlers diagnosed with autism spectrum disorder prior to age three don’t meet the diagnosis when assessed a few years later. A National Institute of Mental Health study even shows that three-quarters of ADHD children outgrow their condition by the time they reach their midtwenties. Lastly, at the end of the book, in a nonblaming, reasonable, highly practical way, I lay out dozens of strategies, tips, and lifestyle changes that parents can utilize to foster self-discipline, even-temperedness, and greater social competence in their kids. Guidelines are included for when to consider pursuing outside professional help and what to look for in a therapist. My guess is that you picked up this book because you sympathize with the notion that as a society we have become too casual medicalizing and abnormalizing children’s behavior. Chances are you eagerly wish to build your knowledge base of commonsense psychological and developmental explanations for children’s emotional issues. Maybe you’re a parent who is perplexed and exasperated by your child’s wayward behavior. You urgently desire a deeper understanding of why your child behaves in a maddening way and what can be done about it. You want your child diagnosed with a psychiatric disorder only if he or she really has one. If you are aided by my book, the countless hours I have spent poring over research literature and magazine articles, reflecting on my work with clients, and taking solo writing trips on retreat in the desert at Joshua Tree, California, will have been well worth it.